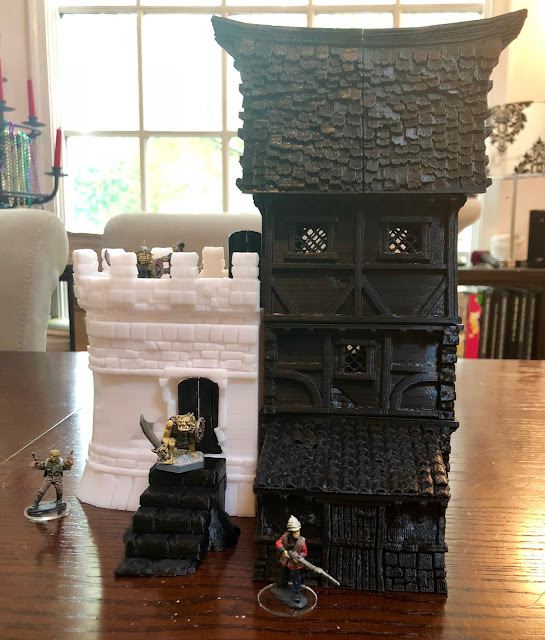 I was excited to finally be able to turn my attention to the files I had received in the Printable Scenery Kickstarter. I chose the War Cottage (below) from their first Winterdale set because it was a more substantial printing project than anything I had tried up to this point (15 separate pieces), and because I knew I would get a laugh out of my wife when she asked what I was working on ("war" and "cottage" aren't words nongamers expect to hear together). Awesome! Great to see some of the Winterdale range brought to life. I have quite a large collection of building terrain already and don't have the space (or money!) to invest in a whole new cityscape. But if I could I'd definitely print out their entire range, it's great stuff! Very cool! Let's see it painted up next. Thanks, gents. I'll post a reply here when I get painted!